True to Marina Vista's name, the park overlooks the water and provides a scenic atmosphere. Sports enthusiasts can enjoy two soccer fields, tennis courts and a softball diamond. Call 570-1725 to reserve your sites. The site was purchased in 1923 as part of the acquisition that included Marine Stadium, Colorado Lagoon and Recreation Park. The site remained undeveloped due to oil recovery activities, title disputes and a portion of the site remained wetlands as part of the Marine Stadium connection to Colorado Lagoon. In the 1960's, the wetlands were filled for the proposed Crosstown Freeway construction. Title issues were settled with the 1968 Alamitos Bay Boundary Settlement Agreement between the City, State of California and private property owners. In the late 1970's, oil operations consolidated on a 1.5-acre parcel between Boat House Lane and Loynes Drive allowing park development. In the late 1970's, soil from the excavation of Spinnaker Bay Channel was placed on the site to raise its elevation and allow topographic variety in the future park. The soil was unfortunately high in salt content, and the quality of park landscaping suffered. Park development began in 1982. Original park facilities included a baseball field, and a soccer field. The freestanding restroom building was added in 1992. In 1994, the Los Angeles County Safe Neighborhood Parks Bond Act of 1992 funded night lighting for the baseball field and other field improvements including the backstop, dugouts, fencing and landscaping. In 1996, a bicycle path was added crossing the park and connecting to the bicycle path down boat House Lane to the rowing center and Jack Dunster Marine Preserve. In 1998, the playground was added with Los Angeles County Safe Neighborhood Parks Bond Act of 1992 funding and community contributions through Partners of Parks and the matching funds program. Also in 1998, the tennis court was completed. This facility was a requirement of the approval of the Spinnaker Bay housing development in 1987 and was built by the developer with the last phase of home development renamed Regatta. In 1999, a sewer and storm drain easement was granted to a housing development on the Knob of Naples site, which crosses the park to Loynes Drive. This development was controversial as a portion of the private site had been unfenced and appeared to be part of the park. American's with Disabilities Act transition plan improvements were completed in 2004. 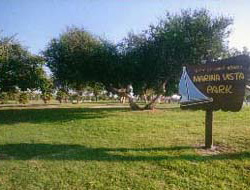 Marina Vista Park, in combination with the northwest end of Marine Stadium is a popular location for Municipal Band concerts. Development of the park was controversial again in 2008 and 2009 as improvements of tidal circulation for Colorado Lagoon considered recreating the open channel between Colorado Lagoon and Marine Stadium through Marina Vista Park. Softball Field, Soccer Fields (2), Play Equipment, Picnic Area, Swimming.